If you are one of those who look out for a birthday present for your kids? You may consider notebook as the birthday present for the lovely baby although your kid may only aged 3. Peewee PC has released a spill and drop resistant notebook, named as Pivot Tablet. The Peewee Pivot Tablet is targeted particularly for children aged 3-10. The Pivot Tablet has been improved for rotating of the display by up to 180 degrees. Powered by 1.6GHz Intel Atom processor, Pivot Tablet is also equipped with 60GB of hard drive. 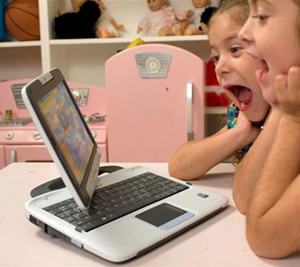 It running on Windows XP with a free Walt Disney Windows XP theme that specifically designed for children, has built-in 1.3-megapixel webcam, and pre-loaded with 10 software and game titles for pre-kindergarten, early elementary or upper-elementary students. In addition, it is Wi-Fi enabled, supports Ethernet, has built-in speaker and microphone, and comes with a 6-cell Li-ion battery that supports up to 5 hours of life. The Peewee Pivot Tablet laptop is now available with the price of $600.